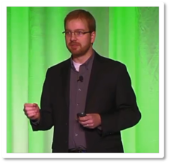 Updates for Qlik Community offerings, announcements and changes. Information on all new product releases, connectors, beta programs, and technical product information. 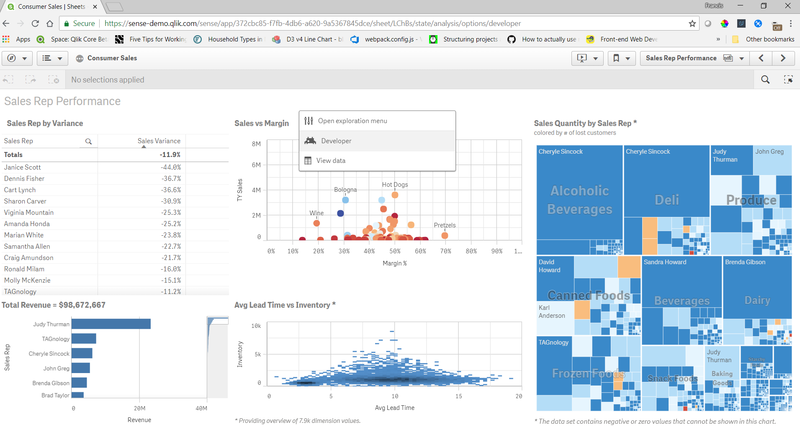 April 2019 Qlik Product Releases are here! Qlik Sense April 2019 sets us apart from the competition with significant advancements to our multi-cloud capabilities and the introduction of our new market leading AI offering, Associative Insights. This release continues to support our position as a leader in the market and the only BI & Analytics solution that supports the diverse needs of customers looking to execute their cloud strategy and push the boundaries with Augmented Intelligence. To begin, Qlik Sense April 2019 introduces new Enterprise SaaS deployment capabilities, running on our multi-cloud Kubernetes architecture, giving our enterprise customers more flexibility and choice on where to deploy Qlik Sense. This new capability allows users to consume, create and reload apps directly on Qlik’s hosted SaaS cloud environment, Qlik Cloud Services, or allows them to deploy Qlik Sense in their own public or private cloud infrastructure using "Qlik Sense on Kubernetes". No matter where you deploy it, it still provides the many benefits of Qlik Sense Enterprise. All deployment options for Qlik Sense Enterprise can work cohesively as part of a multi-cloud deployment framework – which including Qlik Sense Enterprise for Windows. This truly enables us to align with our customers’ journey to the cloud. You will also find in this release the much-anticipated augmented intelligence capability - Associative Insights. This unique and powerful new feature combines our associative and cognitive engines to suggest hidden insights in data for users to explore. Our Associative Engine uniquely identifies the data values that are unrelated to your selections, and our Cognitive engine can now analyze those unrelated values and reveal the most significant insights that might have been overlooked. Associative insights, provides users with peripheral vision, and prompts them to ask additional questions to bring about new, and potentially transformative, discoveries across data sets. New Bar & Area chart – a variant of the standard bar chart giving more flexibility when applying labels to stacked bar charts, showing percentage differences or showing dimension values on the bars. And, our native map chart now has a new background layer that can use any image as a map background. This is great when using custom drawings that require GPS coordinates to analyze specific dimensions – specifically things such as: floor plans/space layouts, hardware positioning, parking grids, stadium seating, transit routes, and much more. We have also released a new iOS app - Qlik Sense Mobile for Blackberry client, which is a containerized version of Qlik Sense Mobile supporting advanced management and security for BYOD (bring your own device) environments. We have added new task notifications to Qlik NPrinting, allowing greater efficiency for administration as well as extended Qlik Associative Big Data Index functionality with additional "live" mode aggregation options in a KPI object, e.g. sum/min/max/avg. As mentioned, all of this content, and much more, will be featured at Qonnections, which is just a month away! Please download the latest product releases from our customer downloads site and let us know what you think in the comments below! When you want to look at the distribution of a measurement, a histogram is one possibility. However, if you want to show the distribution split over several dimensional values, a Box Plot may be a better choice. The graph clearly shows you the performance of the different machines compared to target: Machine A has the precision, but not the accuracy. Machine F has the accuracy, but not the precision. The Box Plot provides an intuitive graphical representation of several properties of the data set. The box itself represents the main group of measurements, with a center line representing the middle of the data. Usually the median and the upper and lower quartile levels are used to define the box, but it is also possible to use the average plus/minus one standard deviation. The whiskers are used to show the spread of the data, e.g. the largest and smallest measurements can be used. Usually, however, the definition is slightly more intricate. Below I will use the definition used in six sigma implementations. There, the whiskers are often used to depict the largest and smallest values within an acceptable range, whereas values outside this range are outliers. The picture below summarizes the box plot. Go to the Tools menu and choose “Box Plot Wizard”. On the “Step 1 - Define data” page, you choose your dimension. In my example, this was Machine, but it could be Supplier or Batch or something similar. Use the same dimension once more in the “Aggregator” control. Use the average of your measurement in the “Expression” control – Avg(Measurement). On the “Step 2 - Presentation” page, you should choose “Median mode”. Check “Include Whiskers” and “Use Outliers”. And with this, I leave you to create your own box plots. Over the years, I have seen the Rank function used in various expressions. 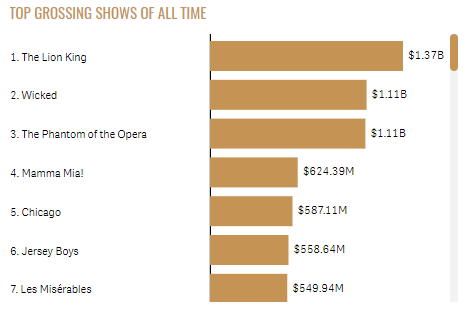 Recently, I was working on a Broadway Shows project where we wanted to show the rank in a bar chart before the label adding a numeric indicator of how a show ranked. You can see what I am referring to in the bar charts used in the Broadway app. The bar chart below is an example of one of the charts. We added the rank before the show name on the y-axis label. “Rank() evaluates the rows of the chart in the expression, and for each row, displays the relative position of the value of the dimension evaluated in the expression. When evaluating the expression, the function compares the result with the result of the other rows containing the current column segment and returns the ranking of the current row within the segment. For charts other than tables, the current column segment is defined as it appears in the chart's straight table equivalent. Originally, I used the Rank function without any arguments. This will rank the products by their sales and display it before the product label. By default, with no arguments for mode and fmt, the Rank function will show the lowest and highest value displayed like a range as seen in the chart above. But what if you want to show a single number for the rank where Product_B and Product_J would show 1 as the rank for both projects since they both tied for first place. This can be accomplished by using the mode and fmt arguments. Mode can take values 0 – 4 and controls which rank is shown for each row for example show the lowest rank, the average rank or the highest rank. The fmt argument takes values 0 – 2 and controls how and where the rank is displayed. You can find the detailed description for each setting in Qlik Sense Help. The mode argument is 4. This will show the lowest rank on the first row, then increment by one for each row. The fmt argument is 1 and this will show the low value on all rows. When there is a tie, only the lowest rank will be displayed on the respective rows. There are not always ties when using the Rank function but when there are, the Rank function provides options for how to handle the display of the rank. This was something I never had a need for until now but I found it to be very valuable so I thought I would share what I have learned. The next time you use the Rank function, try out the various arguments to find the display that works best for your app. One of the new features in the April 2018 release of Qlik Sense was the addition of the NumericalAbbreviation variable. This variable allows users to specify the numeric abbreviations that are used when a numeric value has an Auto number format. This was great because by default, G is used to indicate billions and my preference is to use B. Now, I can do that by editing the NumericalAbbreviation variable in my script. If you are familiar with scripting, you know that the first few lines on the Main tab in the script are SET variable statements that indicate what abbreviations and values you would like to use to represent certain data in your app. For example, in the script below, the MonthNames variable is set to how I would like to abbreviate months in my app. If you created an app using a release prior to the April 2018 release, you will not see this variable on the Main tab in your script but you can add it to your script along with the other variables statements. The easiest way to do this is to copy and paste it from Qlik Help. In the app screenshot below, you can see the G used in the Total Gross KPI and in the Top 10 Theaters bar chart (bottom left). A small, easy tweak to the script, allowed me to change the numeric abbreviation in the app. I should note that the numeric abbreviation is used only when Numbering Format is set to Auto. So, if the Numbering Format is set to something other than Auto such as Money or Number, the NumericAbbreviation variable is not used and the format that you specify in the properties of the object is used. In this blog, I showed one example of how the NumericalAbbreviation variable can be used but it can also be used to add spacing before the abbreviation or other custom abbreviations, if you choose. This seems like a small feature but it has a large impact providing users with more flexibility and control over how the data is displayed. To learn about other new features released in April, check out Michael Tarallo’s Qlik Sense – What’s New April 2018 video. One of our new additions to the charts library is the Waterfall chart. It’s useful to visualize how an initial value evolves (increment or decrements) over time or in distinct stages. It’s widely used across companies and finance analysis seems to be a good fit for the waterfall chart. We commonly see this type of chart for Income or Cash flow statements. Qlik Sense waterfall chart is a simple non-dimensional chart, it’s composed by expressions only. Each measure can be configured to “Add”, “Subtract”, or “Subtotal”. Meaning we have total control over the graphical representation of the values, we could tell a positive number to subtract its value from previous column and viceversa. 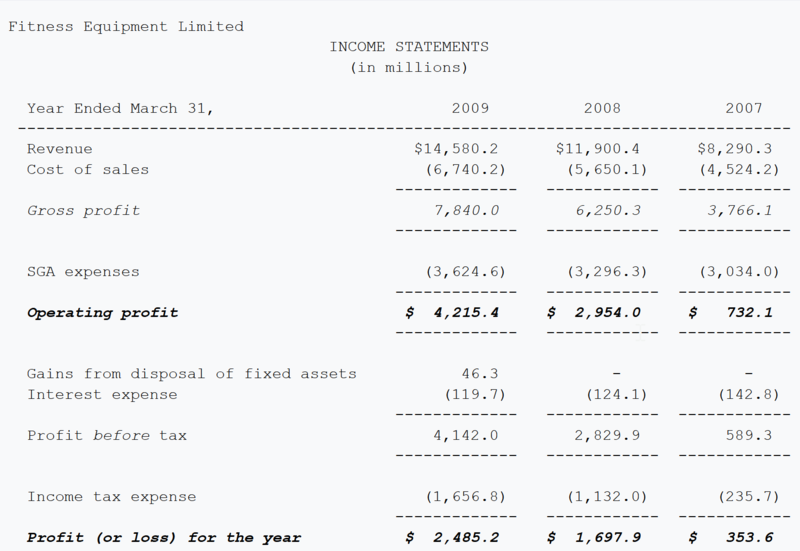 The CFO of the company Fitness Equipment Limited (from Wikipedia) wants to visualize and analyze its company income statement by year. After getting the data into Qlik Sense (one table with three columns, Concept, Year, and Amount) it's time to represent the Income Statements table above with a Waterfall chart. Remember, the goal is to show the profit (or loss) for the year amount, but more importantly how was the flow to get to that amount. Add the first measure, it will typically be the starting amount or opening value. Revenue will make it in our example. For those balance measures and those amounts that denote subtotals such as Gross Profit or Operating profit we don't need to create an expression, we just need to check the subtotal checkbox in the preceding measure. For example, to calculate Gross Profit (Revenue - Cost of Sales) check "Subtotals" check box in Cost of Sales measure and set the "Subtotal label" to Gross Profit. Perform the same operation for all of the balance points in the chart. 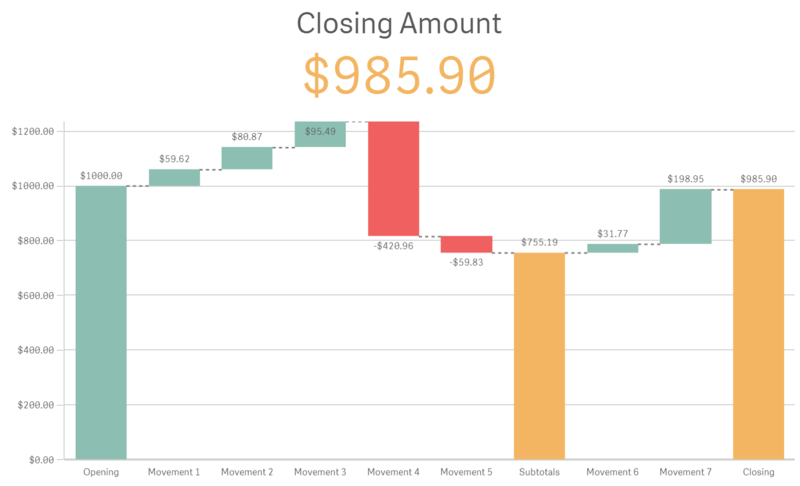 Waterfall chart comes with the usual customization panels as seen in any other Qlik Sense chart, but this time we have a dedicated Color section that includes a color picker for each one of the bar types that inhabit your chart. The final waterfall chart looks like the picture below. It includes a year list box so now the CFO and any user will be able to quickly visualize different years of Income Statements to analyze how each piece contributes to the total profit. 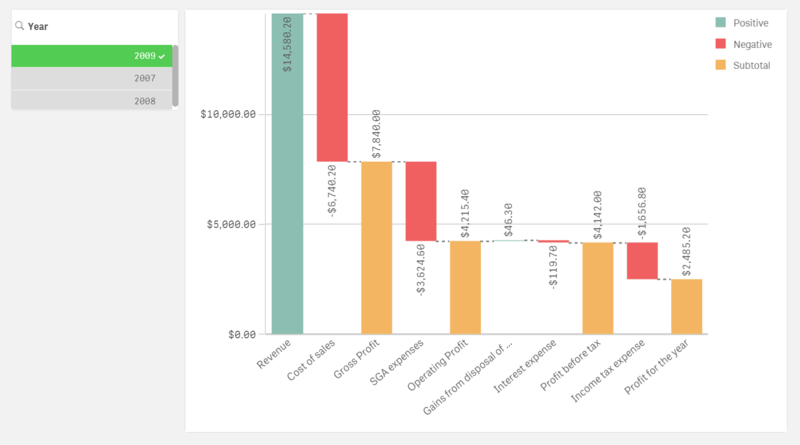 This is just an example of what a Waterfall chart can do for your business but I'm sure there are many more use cases for it, please share your experience with Waterfall chart in the comment section below. QlikTech International AB and its affiliates (collectively, “Qlik”) may from time to time share customer data within its group companies and/or use systems hosted or provided by 3rd parties (collectively, “Subprocessors”) to best provide its Support & Cloud services. Qlik’s Support services are predominantly performed in the customer region: EMEA – Sweden, Spain; Americas – USA; APAC – Japan, Australia, India. Qlik’s Cloud systems also utilize 3rd party systems to best ensure a safe and high-quality Cloud service. The purpose of this document is to inform and keep up-to-date EU/EEA/UK/Swiss Support & Cloud customers of the identities of any Subprocessors for Support services, as per Article 28 of the EU General Data Protection Regulation. Any new Subprocessors will be added to this document within 30 days of appointment. Any Support data is unlikely to contain personal data given the technical nature of the services, however, in the event personal data is received, it is protected by Qlik’s IT and other security related procedures. In addition, Qlik has in place a network of data protection agreements within its company group and with relevant 3rd party system providers to ensure the lawful and safe transfer, use and protection of personal data. For questions related to the information in this document, please contact your usual Qlik representative. This document describes Qlik’s services Data Protection/Privacy Law compliance. For Security related questions (e.g. encryption), you can find further information resources at https://help.qlik.com/. QlikTech México S. de R.L. de C.V.
QlikTech Brasil Comercialização de Software Ltda. 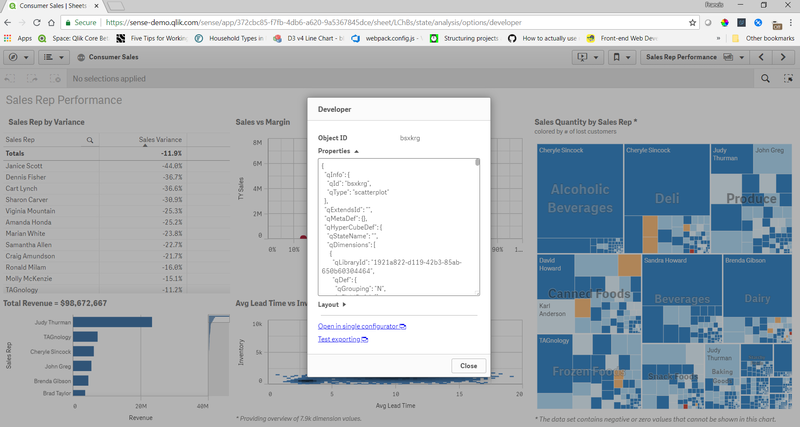 Did you know there's a secret developer menu in Qlik Sense? I'm going to let you in on the secret and show you how to access it and what it contains. Just remember, this isn't documented or officially supported, and is subject to change in the future. Right click on an object and choose "Developer"
You can get the object id, properties, and layout of any object this way. There's also a link to open the object in single configurator, and test exporting. The object id's are useful for embedding visualizations. The properties are useful if you are creating your own objects and want to check the properties of an object in a Qlik Sense app for reference. In my opinion this is the most useful feature of the developer menu. Sometimes if I don't know the correct properties to set to achieve what I want I'll create a similar object in the Qlik Sense client just to check the properties. The layout shows what is returned by the engine for the layout of the object, and can be useful to see what the layout will look like before you actually create an object yourself. And the single configurator link is a handy way to get to the single configurator of an object directly from a sheet. And now you know about the secret developer menu. Please note this patch is branched directly for the latest patch. For example, by applying Qlik Sense February 2019 Patch 2, you will also receive every fix released in Qlik Sense February Patch 1. For more details about the fixes applied in the previous patch(es), please have a look at the release note. These improvements have been made possible by improving the manner in which security rules, database access and our hub service work together. For more details on the improvements and/or bug fixes, please review the attached release notes. The first parameter, text, is the input string. Delimiter1 is the first character to search for in the text while delimiter2 in the second character to search for in the text. The last parameter, n, is optional and is used to search for a specific delimiter pair. Let’s look at some examples. The chart expression below returns 1234. The TextBetween function finds the first open parenthesis and the first close parenthesis and returns the text that is between them. Now if the text included multiple sets of data in parentheses, I can use the chart expression below to get the text in the third parentheses set. This chart expression returns 3456 because I have set the fourth parameter to 3 in the TextBetween function which means I want the text between the third delimiter pair (the third pair of parentheses). TextBetween can also be used in the script. In the script snippet below, I load 3 products into a table named Temp. Then I parse the Product field using TextBetween to create another field in the Products table named Product Code. In the past, I would have approached this parsing exercise differently. I would have used a combination of functions like the index function and the mid function to parse out the product code. Using the TextBetween function is so much easier, cleaner and more straight-forward. I cannot believe it took me this long to learn about it but I am glad I know about it now. We have released a new version of our brilliant QlikView Governance Dashboard which is now available on our download site. This new dashboard was developed to help administrators have oversight of their QlikView implementation and contains new functionality aimed at the upcoming QlikView November 2017 release. 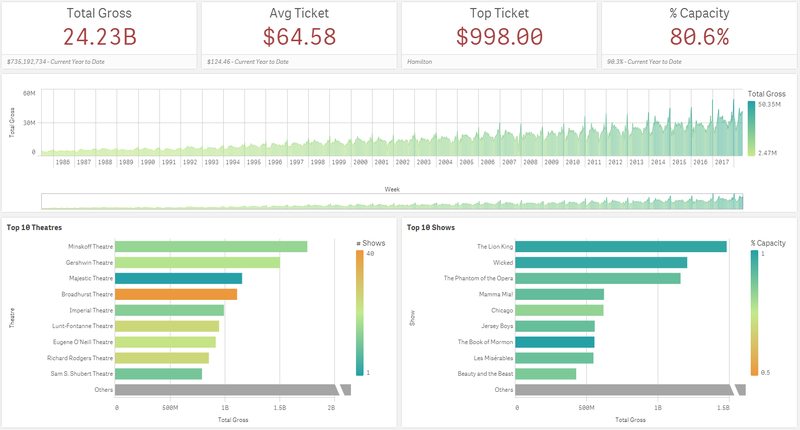 We previously highlighted the changes which QlikView November 2017 will bring to Search and Select ( https://community.qlik.com/blogs/supportupdates/2017/09/22/upcoming-changes-in-search-select-qlik-sense-and-qlikview ) and the new Governance Dashboard will help you identify which QlikView documents may have Set Analysis expressions affected by the changes. For more details please see the attached release notes. Thank you for choosing Qlik software. Students from all over Pennsylvania gathered at Villanova University this past Friday to kick of the 2019 DataFest- Philadelphia. What is DataFest: DataFest brings together the data science community and undergraduate students by putting together a weekend long hackathon! Students from universities break up into groups and are all given the same data sets to analyze. Consultants ranging from statisticians to visualization and analytics experts are also there to help the students analyze and pull together their findings. After two days of intense data wrangling, analysis, and presentation design, each team is allowed a few minutes and no more than two slides to impress a panel of judges. Prizes are given for Best in Show, Best Visualization, and Best Use of External Data. The Qlik Academic Program was present and helped many of the students who decided use Qlik as their analysis and visualization tool! Many of them took advantage of building easy Qlik Sense charts and they even used Qlik's storytelling function to deliver their presentations! Universities in attendance included Villanova, Penn State, Bucknell and many more! Stay tuned for more pictures and winner information! Do you need to display the top performance person’s name in the dashboard? For example, you need to display the name of top salesperson. It is easy to do so with a table displaying the list of sales reps with sales amount, sorted from the highest value, but you just need to display the top sales person’s name in your dashboard. Here is how to do it. As is almost always the case with QlikView, there is more than one way to accomplish this task. The first way is to use the firstsortedvalue and aggr functions. The expression first calculates the Sum([Sales Amt]) and aggregates it by Salesperson. The firstsortedvalue function then looks at the all the Sales Amt values and, because we are using a minus sign in front of the sort value, displays the Salesperson with the top Sales Amt. Another way to accomplish the task is to use the functions Rank, Aggr and Only. This approach is a little more complicated but equally as effective. First, the expression takes the Sum([Sales Amt]) and aggregates that by Salesperson. Next, a rank is created based on the aggregated Sales Amt. The expression then takes only the Salesperson with a rank of one and displays it in the textbox. Good Luck and Happy Qliking! In his new post, Qlik's Chief Learning Officer Kevin Hanegan explain the power of perspective, when perceptions create our reality. With this month being both Diversity and Autism Awareness month, he shares his thoughts on the importance of exploring a variety of perspectives, becoming aware of any implicit bias that exists, and embracing diversity at both a personal and a professional level. Authentication and Authorization are two important concepts in securing any application. Let’s start with some simple definitions. Authentication makes sure that the person accessing the system is the person he says he is. Authorization only lets you access information and complete actions that you are allowed to, based on your identity. One of the most common misunderstandings around this is what services are part of what step in the process. The first two steps covering authentication are handled by the web layer (i.e. QVWS or IIS). The third step is achieved by the web layer transferring the identity to the QlikView Server using the QVP protocol. The fourth step is authorization and is handled by the QlikView Server using groups resolved by the Directory Service Connector. QlikView does not have to store passwords; these are stored by an identity provider such as LDAP or AD. Normal procedures for user management can be applied, which enables that adherence to security policies are maintained. It is possible to customize authentication without affecting authorization, which gives us the option to use external identify providers such as Google and Salesforce. All Authorization is done in the backend, making it easier to protect. The role of the Directory Service Connector in the flow is somewhat blurred by the fact that almost all QlikView components use it. The web layer, QlikView Server, QlikView Management Service, and the QlikView Publisher all use the Directory Service Connector for different things. Most QlikView components use the Directory Service Connector for authorization or to get information about users except if custom users are used. If you use custom users, these get authenticated towards the Directory Service Connector, which in this special case stores identity and passwords for the users. Remember, as a rule of thumb: the front end components handle authentication and the backend components handle authorization. 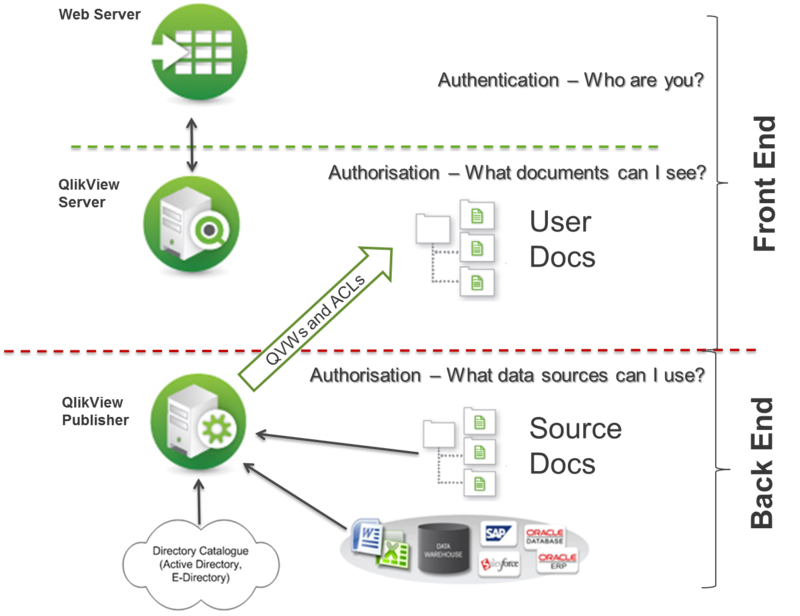 I hope this help gives you a clearer picture of how QlikView handles authentication and authorization and which components are used in which part of the flow. Have further questions you’d like me to answer? Leave me a comment! Hello Qlik Community, in this post our guest blogger and Principal Enterprise Architect, Marcus Spitzmiller, joins us again to introduce the Qlik Scalability Tool and the brief video series he created that addresses it. Marcus is a member of the Qlik Enterprise Architecture team focusing on enterprise deployments and best practices. His areas of expertise include scalability and performance, deployment best practices, integration, and security. Qlik Sense Performance Benchmark (http://www.qlik.com/resource-library/qlik-sense-performance-benchmark). The Scalability Tool works by simulating virtual users making selections in a Qlik Sense application. The Scalability Tool itself captures results into log files, as does Qlik Sense along with performance counter information, and that information is loaded into a Qlik application (https://community.qlik.com/docs/DOC-15451) used to review and analyze. In the Qlik application, you can see things like CPU and RAM utilization, response times, and much more. I created a three part video series (https://community.qlik.com/docs/DOC-16750) to help you get started so you can learn more and see it in action. Please remember that this is more of a jump start and it isn’t intended to be comprehensive. The documentation that comes along with the Scalability Tool does that.